Every etching, drypoint, and mezzotint that has been identified is reproduced in our catalogue raisonné, with basic details of the title, medium, date, size, any inscriptions, and the number of different states and impressions that have been located. 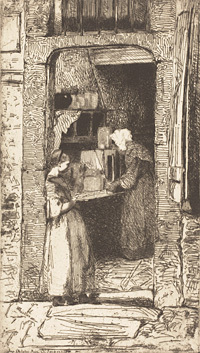 In addition, brief details of the publication of individual etchings is given, and the catalogue numbers in earlier catalogues raisonnés of Whistler's etchings are recorded. Below this basic information, tabs lead to further information on the source of the title, on the subjects, sitters and sites shown in the prints, the different states leading to the final composition of each etching, the copper plates (most of which are reproduced), a brief discussion of technique and records of printing, paper and inking, and on the exhibition, publication and early records of print collecting. Finally there is a tab for references, giving a select bibliography of catalogues, exhibition catalogues, journals and other published references.